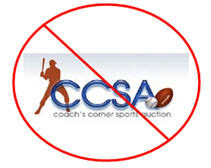 You might remember a couple of months ago the decision SCD made to no longer accept advertising from Coaches Corner Auctions. Mike the Ring Guy at Sports Blog, spearheaded the crusade. Today he posted a follow up, which focused on the editorial response SCD would give to the matter and the fact that, to date, none has been made. I knew at the time of their statement it wasn't in their best intrests, from a business or legal perspective, to address the issue editorially. As someone who works in publishing and sells advertising, you just don't lambast a former advertiser. It is simply bad business and sends a bad message to current or potential advertisers. Don't get me wrong, SCD cannot have it both ways. They can't advocate being a resource for collectors while talking Coaches Corner dirty money and they did the right thing in not renewing their ad schedule. With the FBI deeply involved in an ongoing investigation, if and when indicments are handed down, the last thing SCD wants is to be tied to a company, in any way, that has flooded the market with fraudulent material. The arguement could be made that their advertisements promoted and made readily available a market for the bogus material (which it did)and has the potential for class action lawsuit written all over it. Thanks for following up with this. I don't think SCD can say much ... they cxl'd the contract and saying anything would be a legal risk. However, they should report on the FBI probe. Hmmm... for a while, CC was one of the banner ads on the bottom of the Topps.com site. Should Topps be held accountable as well? I looked this evening and I couldn't find a CC ad at Topps, but they were there about a month ago.